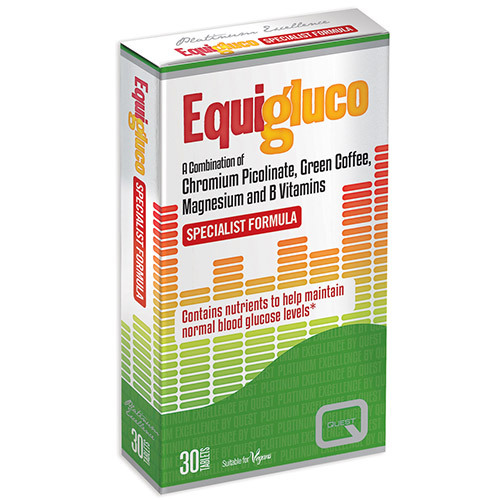 Quest EquiGluco is a specially formulated tablet that can be used to help control blood sugar and support a weight loss programme. How does EquiGluco help control blood sugar? Green coffee bean extract contains high levels of chlorogenic acids, which have been shown to influence both glucose and fat metabolism. A recent study found that a dose of 400mg of green coffee extract was associated with a 24% drop in blood sugar levels 30 minutes after taking the extract and a 31% drop 120 minutes later. Chromium has a very well established role in optimal insulin function and blood sugar control. Magnesium intake can improve the control of blood sugar levels due to its role in glucose metabolism. Vitamin B6 contributes to normal glycogen metabolism, which helps to maintain normal blood glucose. Glycogen is stored in the body as a long-term energy source and is broken down and converted to glucose when needed for energy, after eating or between meals and during exercise. How does EquiGluco help promote weight loss? Green coffee bean extract contains high levels of chlorogenic acid, which through its influence on glucose and fat metabolism in the body, promotes weight loss. Chlorogenic acids reduce blood glucose levels and inhibit the metabolism of glucose as an energy source in the body (through its inhibitory effect on the enzyme glucose-6-phosphatase). This activates the metabolism of fat in the liver and promotes the use of fat stores in the body as an alternate energy source. There is research to suggest that chromium picolinate`s efficacy in maintaining normal glucose regulation can also reduce sugar/carbohydrate cravings and binge eating, thereby helping in a weight loss regime. Di-calcium phosphate, green coffee extract (provides chlorogenic acids), mineral amino acid blend (provides magnesium oxide complexed with aspartic acid, citric acid, hydrolysed rice protein), microcrystalline cellulose, coating (hydroxypropylmethylcellulose, titanium dioxide), croscarmellose sodium, magnesium stearate, anticaking agent: silicon dioxide, niacin, B6 (with methyl cellulose), chromium picolinate. Each tablet contains no more than 3% caffeine. Take 1 tablet immediately before or with food/meals, up to a maximum of 3 tablets daily. Do not exceed stated dosage unless instructed by a qualified health professional. Below are reviews of Quest EquiGluco - 30 Tablets by bodykind customers. If you have tried this product we'd love to hear what you think so please leave a review.